Replacing the windows and front door took a good amount of time. We have random people stop by ALL of the time. The day that Thomas replaced the front door a woman stopped by and asked to buy the old door. Thomas, the golden hearted man that he is, wanted to give it to her. I, on the other hand, wanted cash so he left the matter up to me. The woman hauled off my old front door and I made $25 from the deal. Not too shabby. Another Saturday a different woman stopped by to see what we were doing with the white drawers from the kitchen cabinets that were outside. I didn’t have a vision for them, but didn’t want to part with them. She ended up staying and talking Thomas’ ear off for over an hour. He mentioned that we were going to replace the windows and she was shocked! 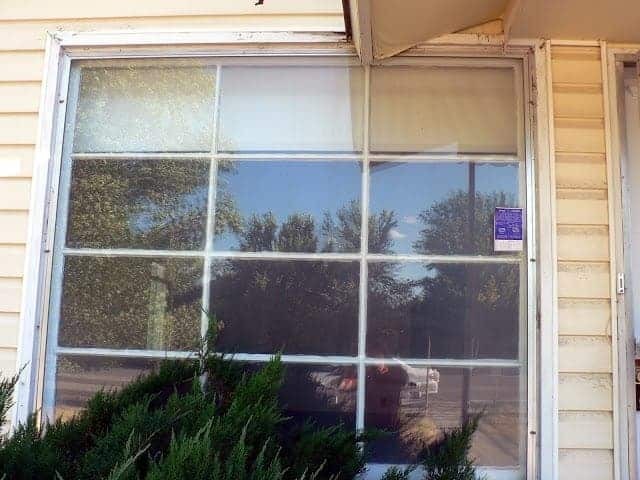 Why would we replace perfectly good windows?!? People can be so funny. Old, rotten, drafty, single pane windows are not “perfectly good” in our opinion. This window is HUGE. It’s almost 6′ by 6′. I love the lines in it, but it needed to go. Why hello there husband! What a huge hole you’ve made! This is the new front door – not bad at $178 on sale at Home Depot. Removing the interior window sill. Here is the other old window to the left of the porch. Not quite as huge but still really big. That’s what I’ll love looking out of when I sit down at my kitchen table one day! We aren’t quite sure what to do with the old windows, so they just sit inside the house at the moment and we’ll just move them to the garage until we figure something out. Old window anyone? Suggestions for creative window crafts? We love caulk. Thomas used it to seal around the windows. Goodbye drafts and mice! 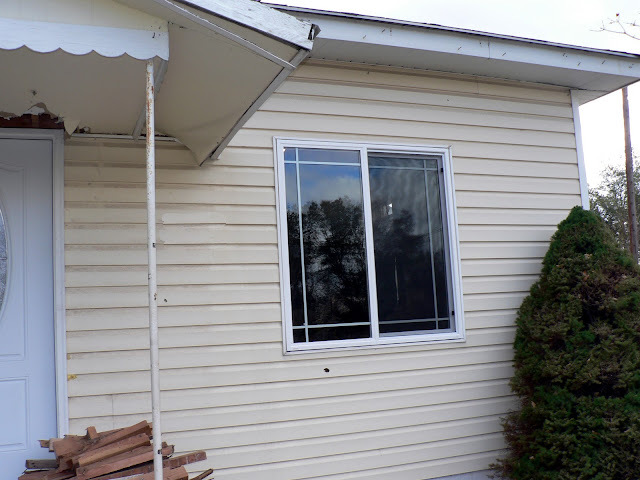 Here is the new window to the left of the porch! I think it’s so pretty. The bigger window looks just like it, except, well, bigger. Melissa old windows are super popular right now, I see them all the time. Consignment shops have them all the time and I know I have friends that buy them and do crafts. You might be able to sale them. I don’t know if you are doing any gardening, but in square foot gardening you can use them in the winter to create a green house effect in the winter to help the plants grow.